today I was doing some maintenance on my 3D printer, while disconnecting the power supply to the RAMPS module I saw that a pin was completed burned (see attached picture). I built my 3D printer following Tom's guide on Dolly (Prusa MK2 clone) and I never had any issue with it. Sometimes I had some thermal runaway errors, but they were false positives (particle fan on bed temperature sensor). Lately I had the board shutdown when it's too hot: I got no errors, simply it stopped moving and heating, then the thermal protection kicks in. I added a PC fan next to electronics and it solved the issue. I know RAMPS aren't the best available board, but I just wanted to know if that's something that happens from time to time or I did something wrong. Could it be an undersized wire? This is a common reason why people use add-on MOSFET boards to redirect current away from the controller board. The controller board only performs the switching of the MOSFET through control wires while the power for the heated bed passes through the MOSFET module. 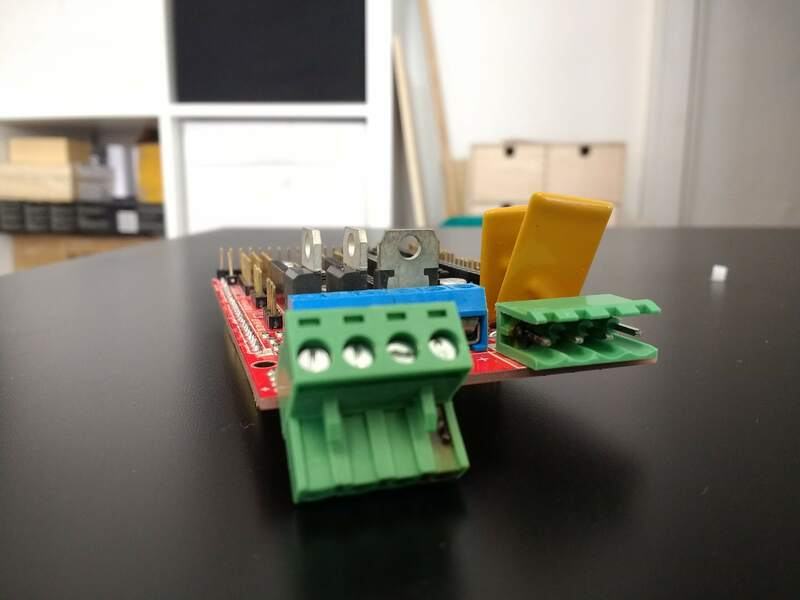 The connectors on such modules are usually better too--gold plated or copper broad terminals, in which you may insert crimped wires. BIQU style MOSFET modules can be bought for around $3.50, which is good insurance against damaging the RAMPS or starting a fire. If you don't wish to purchase such a module, a best practice is to crimp your wire ends with ferrules before securing them in the screw terminals of the "Phoenix" quick release connector. Also, make sure you add a heat sink to the first (D8) MOSFET--as large as you can find/install.